This school year I am trying to make the final transition to entirely digital planning and organization. 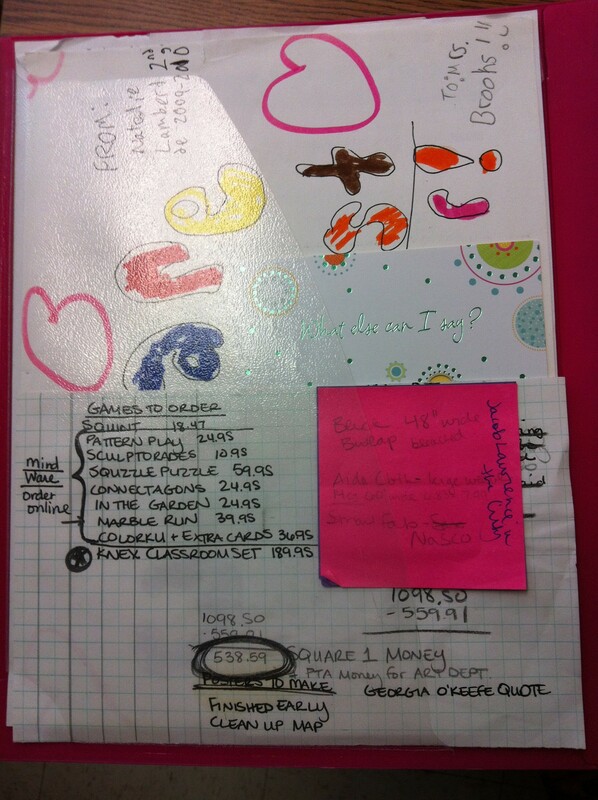 I have always been a promoter of technology use in the art room, and I have always used the computer to maintain my scope and sequence, but I have been holding onto my physical teacher binder filled with paper plans. Since the beginning of this year, I have been working to organize my lesson plans digitally in an effort to finally transition from my teacher binder to a well organized digital filing system where all lesson plans, power points, example images and lesson notes are easy to access from my computer. After reading a post on The Teaching Palette, I decided to give Evernote a try. I like that Evernote can be arranged in notebooks, which is a similar style to how I have been organizing lessons in binders ever since I started teaching. 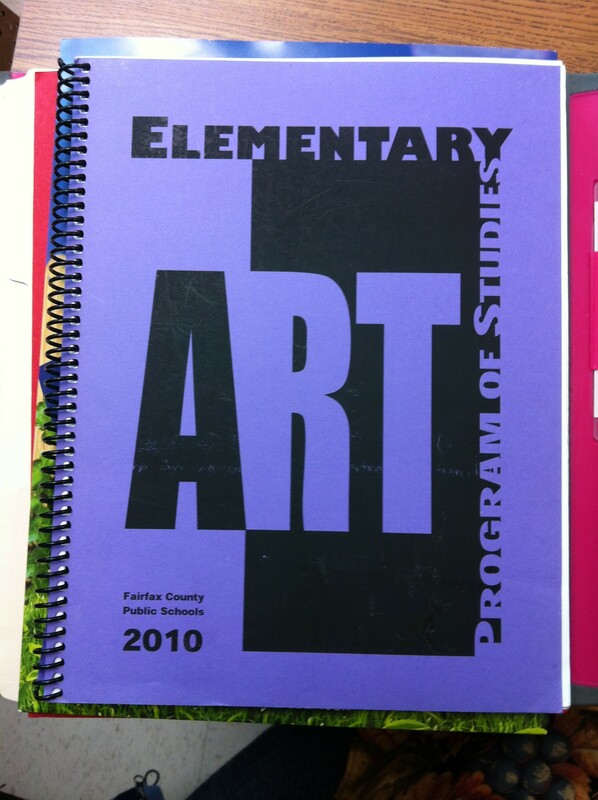 In the past I have always had a binder for each grade level, and as I have updated or created new art lessons over the years I have printed each revised lesson and replaced the old copy with the new one in my binder. 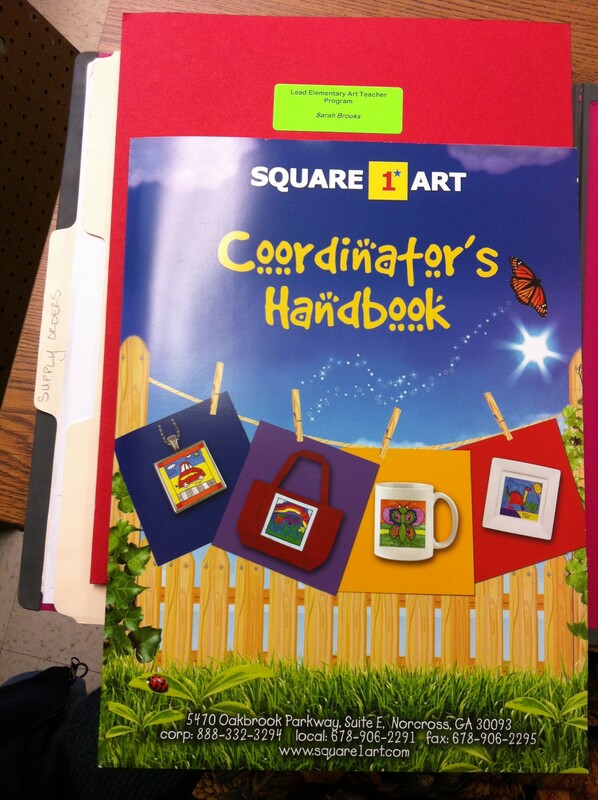 The grade level binders includes the lesson plans in our county’s format, post-it notes with ideas for adaptations or alternate art media, as well as any handouts, planning matrices, reflection documents, rubrics, or example images. I have a large portfolio drawer system where I store teacher examples of completed artworks for each project, as well as any posters I might have made for display during the project. Digitally I kept the lesson plans, powerpoints, handouts & other documents grouped in grade level files on my computer and stored them in my Dropbox, so that I could edit and reprint them as needed. Over the summer I started thinking about how to better organize my digital files so that the most updated versions of each file were easier to find. Over the past 5 years I have accumulated so many different versions of my lesson plans, and have remade powerpoints each year as I have found better ways to present info, new artist exemplars to display, and refined my techniques for each lesson. Even the transition from powerpoint files to SMART Notebook files for use with my smartboard has dramatically increased the number of files I have stored in my Dropbox. 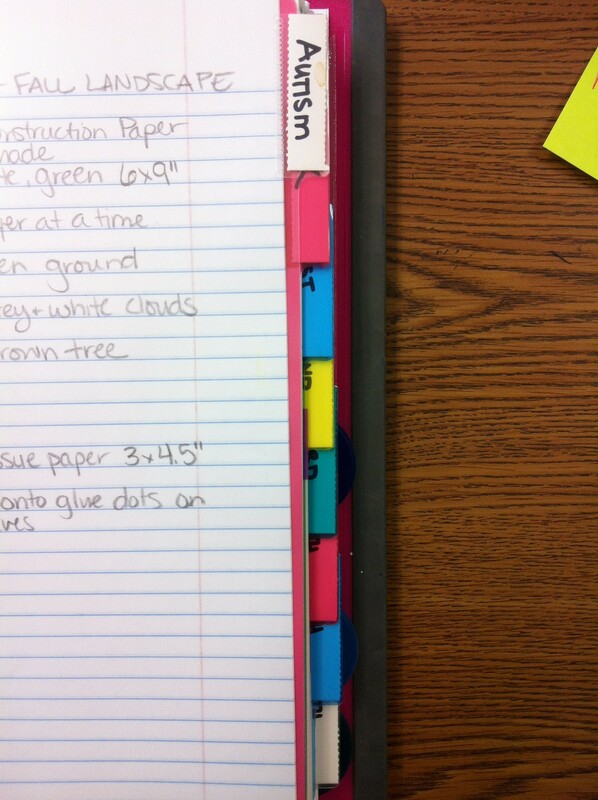 This year I have started using Evernote to organize my grade level binders and files. I started by creating an Evernote notebook for each grade level I teach. I also included one for general info, such as my daily schedule, scope and sequence, weekly planner, lesson plan template file, program of studies and seating chart templates. Additionally I created notebooks for art advocacy ideas, contemporary artists, and art room ideas. Each grade level notebook includes a note page for each unit that I cover for that grade level during the year, as well as units that I have used in the past that I want to save for future use. The note page is labeled with the lesson title as well as the number of class periods I expect the unit to take. 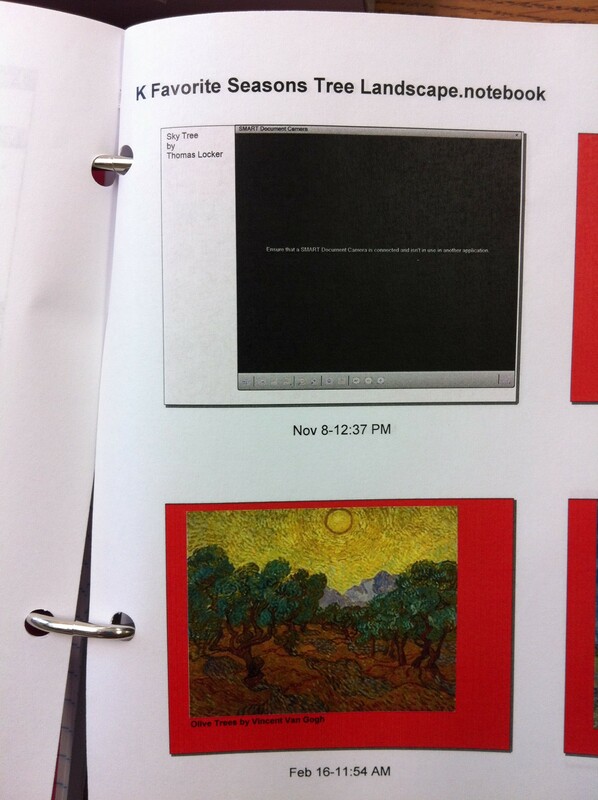 The note page includes a photo example of a completed student art work, Simplified notes on the daily lesson steps for each day of the unit, the official lesson plan with full details, the SMART Notebook file or PowerPoint file that includes images for class discussion, and the handouts, planning matrices and reflection documents for that unit. 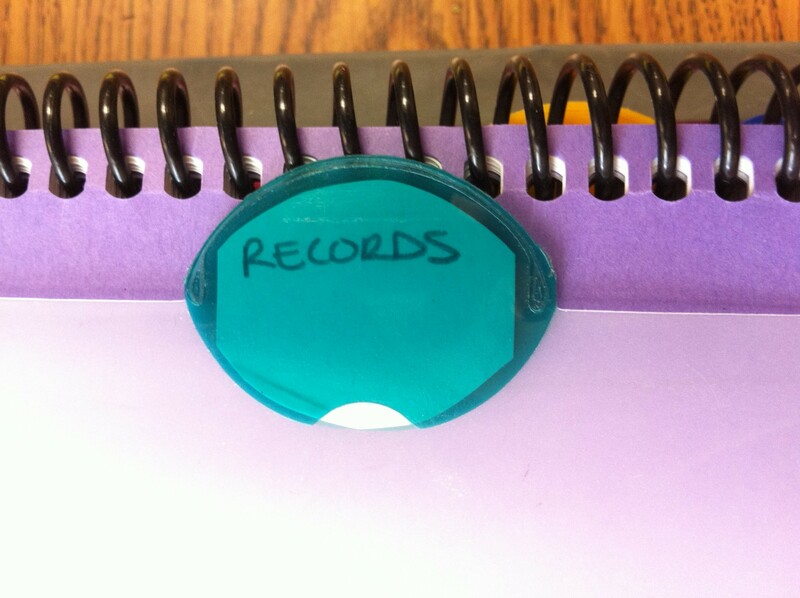 Essentially, I am transforming my paperwork binders into a digital master binder that stores all of the information in one place. When I update a lesson plan or file, I delete the file link in Evernote and insert the updated file or document. In the morning when I arrive to prepare for the day, I set up my computer, open the Evernote program and when a class arrives I simply click on the file that I need to use during that class period. The file opens directly from the Evernote note page, without me having to hunt it down in a long list of files and documents on my computer. This system has made it very easy to share all of my information with my student teacher and my mentee, the new part-time art teacher at my school. I have shared all of my teacher related notebooks with them and we are all synched digitally so that any time I update a note or notebook, all three of us have the most updated version. My student teacher quickly got on board and has used Evernote to create her own notebook and shares that notebook with me, so that I also have her most up-to-date files. I also shared my notebooks with my best friend who is an art teacher at a different school in the same county as me- since we frequently plan our year together over the summer, this was an easy way to share information with each other. Since all of my work files are stored on the cloud via Dropbox, I have Dropbox and Evernote installed and synched to my work laptop, home laptop, iPhone and iPad. Now I have access to all of my files and my organization system wherever I am. This has made planning from home and preparing for emergency sub plans so much easier this year. I don’t have to lug my lesson binder or work laptop home at all anymore. My goal is to have my entire collection of lessons, handouts, documents, and images organized using this new Evernote system by the end of this school year. I will probably still keep a basic planner on my desk, in case of observations or emergencies (such as power outage or internet system woes), but I have rarely refer to it for my own needs this year.